"So actually, Krishna, or God, has many dealings with His many devotees, and that particular dealing may be called His name. Therefore... He has innumerable devotees, therefore He has innumerable names. You cannot fix up one name. But this Krishna name means 'all-attractive.' He attracts everyone. That is the real name, all-attractive. You have seen Krishna's picture. 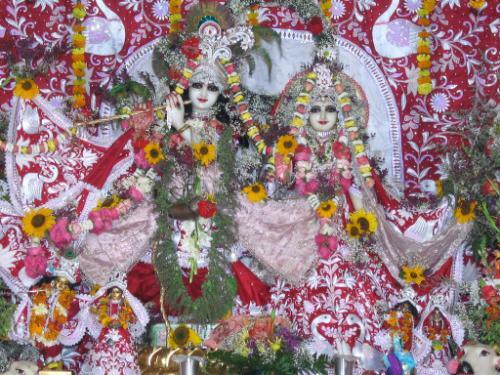 He is attractive to the animals, cows, calves, birds, bees, trees, plants, water, in Vrndavana. He's attractive to the cowherds boy. He's attractive to the gopis, He's attractive to Nanda Maharaja, He's attractive to the Pandavas. He's still attractive to the whole human society. Therefore, if any particular name can be given to God, that is Krishna."